This website is a project done for the Cartography and Visualization course (Geography 351) offered through the Department of Geography at Simon Fraser University in Burnaby, British Columbia, Canada. This website is best viewed using Firefox and requires Flash plugins. To fully take advantage of the audio features of this site, a set of stereo headphones are recommended. View the main map here. The Stanley Park Soundmap is a web-based document of the sonic attributes of one of North America's largest urban parks located in Vancouver, British Columbia, Canada. Using a GPS unit, and a compact digital audio recorder 13 positions in the park were documented on a cool sunny day on Thursday, March 12, 2009. The location data and sound recordings were then linked to a map created in a Geographic Information Systems (GIS) based desktop application. The Soundmap as a means of documenting environmental sound was used by the World Soundscape Project in a series of publications in the 1970's in which researcher and composer R. Murray Schafer and colleagues traveled within Canada and Europe to collect data on local soundscapes (Schafer 1977) . The Soundscape as characterized by Barry Truax, refers to much more than sound within the environment; it is a term that relates to how individuals and the culture at large perceive and respond to environmental sound (Truax 2001) . 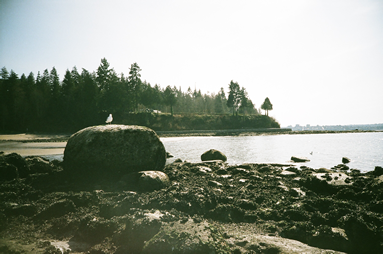 The soundscapes encountered in Stanley Park were qualitatively described in a type of journal entry. "Earwitness accounts," are a method that Schaffer values as an important means of documenting sound (Schafer 1994) . Indeed the objectivity of the digital recordings are a weak substitute for the actual experience of sounds within their environments. As this project developed, these accounts in addition to the recordings served to reshape the author's understanding and perception of Stanley Park as a pristine wilderness area at the edge of downtown Vancouver. The sounds of the surrounding urban infrastructure makes a strong presence throughout the park, and in many ways detracts from its visual appeal. Teaching Assistants Liliana Perez and Anthony Jjumba for all the feedback and valuable instruction during the term. Justin Song, SFU Department of Geography for helping me obtain a GPS unit, and assistance with subsequent data processing. Barry Truax, Professor, SFU School of Communications, for lending me a dB meter from the department, that unfortunately was not used for data collection. His text, Principles of Acoustic Communication, however, provided much inspiration for this website. Dr. Suzana Dragicevic, SFU Department of Geography for being supportive and allowing me to start this project behind the deadline. Leah, my partner, for letting me drag her through Stanley Park on a cold day and backing up all GPS data in a notebook and being supportive during the creation of this project.